The following article was published in Executive Intelligence Review (EIR) magazine, and is reprinted here with permission of the editors. 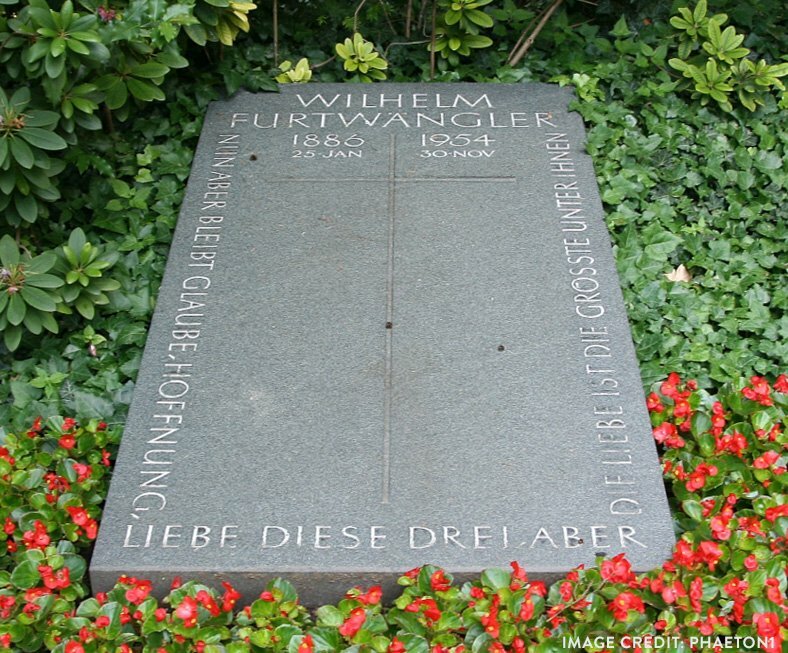 Wilhelm Furtwängler's grave, in the Bergfriedhof cemetery outside of Heidelberg, Germany. Inscribed on the tombstone are the words of St. Paul: "Meanwhile, these three: Faith, Hope and Love abide with us, but the greatest of these is Love." Not coincidentally, these are also the last words of Johannes Brahms' final vocal composition, Die Vier Ernste Gesänge (Four Serious Songs). Brahms' lifelong friend Clara Schumann had suffered a massive stroke in March of 1896, shortly after playing her last public concert at which she performed Brahms' Variations on a Theme by Haydn. Brahms, anticipating that Clara Schumann would soon die, composed this series of four songs based on biblical text. Brahms himself would die the following year. Immortality is not merely the unceasing extension of mortality. It is not a never-ending longevity of the flesh. Rather, just as infinity is not the sum of an unlimited number of finites, eternity exists above time, outside of time. The eternal is not contained within and cannot be attained through the additive aggregate sum of temporals. The sequential chronology of what we call elapsed time is merely the unfolding shadows of something higher — the meaning of each moment cannot be located within the moment itself, but only from the standpoint of the greater flow of which it is a passing part. And without the prior existence of the whole, there could be no possibility for the existence of the parts. Recording of Wilhelm Furtwängler conducting the Berlin Philharmonic in a 1953 performance of Franz Schubert's Symphony n°9 in C-Major, D 944. The constant change in tempo so characteristic of Furtwängler's music indicates the presence of a higher law, a higher time, dictating the unfolding of each moment in time. These are not arbitrary changes, not precalculated mathematical values, but the pulse of a living, breathing organism united by a single all-embracing coherent process of development, proceeding always into the future, residing in what is yet to come. The performer subordinates himself to that power, that higher law, striving always towards the apprehension of the unity which brings coherence to the multiplicity of the parts — an almost religious quality of devotion. The forgoing typifies Furtwängler's insight into an actually ontological principle, one which extends far beyond music per se, which is as true in science as it is in art. It shouldn't come as a surprise that Furtwängler's contemporaries Max Planck and Albert Einstein were themselves devoted musicians as much as they were scientists. In fact, Furtwängler's composition teacher when he was a young man, Joseph Rheinberger (who was himself a friend and collaborator of Johannes Brahms), had also taught composition to the young Max Planck. The implications of Einstein's allusion to Bach's fugues are very revealing when considered in light of his contemporary Furtwängler's insights as quoted above. When we consider the necessary existence of a unified whole in music, which as Furtwängler says "controls the behavior of the individual elements within it, down to the smallest detail," we must ask: where does that whole exist? If the whole cannot exist in any part, nor in the aggregate of all the parts, where and when can we locate the existence of this unifying whole? Only by listening to the future, to that totality which can never exist in the sequential temporal experiences of the ear, but only in the imagination which can consider the entire composition as a one, existing as a unity outside of time. By hearing that single unified Being and following it as it guides us through the inexorable evolution of its own Becoming. By allowing the inaudible echo of that yet-to-be-experienced future to resonate within the audible sounds of the present, each meeting and mutually interacting with one another at each unfolding moment in time. At no one moment of the sensed experience in time can this whole be perceived, however it is present at all times, above time, guiding the behavior of each moment of the unfolding experience of time. "Love — love that is forever being seized and shaken by the work — can never be replaced. Love alone creates the preconditions for the visionary and correct understanding of 'the whole' in the work of art, for this whole is nothing but love. Each individual part can be more or less understood intellectually, but the whole can only ever be grasped by the living feeling of love. It is the only thing which is appropriate and fitting to the whole work of art as an image of the active and living world. Everything else, however skillful it may be, is limited, and therefore profoundly boring to me. "— W. FurtwänglerNotebooks, 19367Wilhelm Furtwängler: Notebooks 1924-1954, op.cit. Furtwängler insisted, without the dedication to the "the living feeling of love" which is required to grasp the understanding of a work of art in its wholeness, music dies, and becomes nothing more than the intellectualized assembly of individual separate parts rather than a single, living, organic whole. In the essay cited previously8Furtwängler on Music: Essays and Addresses, "Thoughts for All Seasons"op. cit., Furtwängler asks the question: what is the emotion which is required by the artist to grasp this fundamental unity of the whole? For Furtwängler, the late compositions of Beethoven represented the high-point in this ideal of cohesive artistic unity in which the parts became absolutely subordinated and inseparable from the whole — an ideal which, however, was increasingly abandoned following Beethoven's death. "Today the concept of overall form has lost its central, dominant position. No longer does it appear to be able to assert itself over the material. No longer is it the whole that controls the behavior of the parts. ...The whole has been consumed by the parts, with the result that, not only is there no longer a whole, but there are also no longer any parts, because these can only exist so long as there is a whole to which they can refer! Everything exhausts itself in the individual moment, no heed being paid either to what has gone before or to what follows. The consequence is a concentration on the effect of the moment, effect for its own sake, in harmony, in rhythm, in orchestration, and through numerous little titillating details." Thus, quite literally: "Though I may speak with the tongues of men and of angels, but I have not love, so am I become as sounding brass, or a tinkling cymbal." Furtwängler clearly identified what he saw as the tragedy of music's decline as being fundamentally rooted in the loss among his contemporaries of the capacity for love. And indeed, Furtwängler's music has a reverential, devout, almost religious quality to it. The orchestra under Furtwängler, becomes fused into a single instrument, a single organism, and becomes in his words "a point of entry of the divine." "The sense of the orchestra as an artistic medium is that this body, constituting of 90–100 different people, different heads and hands, becomes one instrument through which a soul, a feeling, an intuition is communicated to the listener in its tiniest details. The more it achieves this, the more it loses its vanity of wanting to be something itself, the more it becomes the mediator, the communicator, the vessel and point of entry of the divine, speaking through the great masters. "— W. FurtwänglerNotebooks, 192910Wilhelm Furtwängler: Notebooks 1924-1954, op.cit. "The individual feels the futility of human desires and aims, and the sublimity and marvelous order which reveal themselves both in nature and in the world of thought. Individual existence impresses him as a sort of prison and he wants to experience the universe as a single significant whole. Furtwängler's music allows us to do just that. Furtwängler enables his audiences to escape that prison of shadows and sense-experience, and to experience instead the unheard music which lies beyond the notes. Each sound may quickly die, but the music which created it is eternal. Recording of Yehudi Menuhin performing Ludwig van Beethoven's Violin Concerto in D major, Op. 61 with Wilhelm Furtwängler in 1953, one year prior to Furtwängler's death.